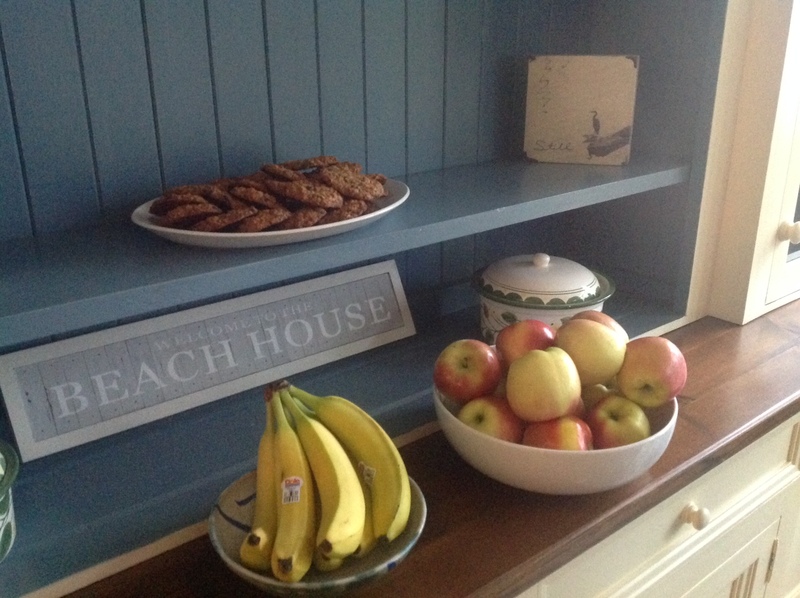 How do you host a writers’ retreat? Well, darned if I know! You see, in the past, we as a group mostly enjoyed each other’s company in single day critique group sessions. The kind of marathon group meeting where you arrive full of excitement and leave four hours later, dazed and confused. Not to mention utterly drained. Having said that, we did indulge in that massive, 5-day retreat at Whistler, two years ago this June, an awesome experience and yet one unlikely to be repeated. On that occasion, we set out to critique a ‘novel-a-day’. One day for each of the 5writers. After fretting and planning for months, we decided to splurge and book the Pan-Pacific Hotel (at an admittedly unbelievable off-season rate) and ended up ensconced in alpine luxury. This also meant any one of us could creep away at anytime to the sanctuary of our room. Breakfast was included and, at the end of each day of ‘critique group carnage’, we managed to end with some festive group bonding dinners at local restaurants (since by then, we were all too tired to cook). All in all, an exhausting but memorable experience. But tomorrow, we 5writers are trying something new. After months of ‘spinning our wheels’, we’re fed up. In a year marked by challenges for many of us, geographic and otherwise, we’ve found that – with some notable exceptions – we 5writers haven’t actually done much er, writing. So we’re going to try to fix that. For three days and two nights we’re just going to write. Plain as that. Except that in a crazy moment of insanity, I volunteered to play ‘hostess’, without a thought to what that actually entails. So in the last few days I’ve started to panic a little. I mean, how do you host a Writers’ Retreat? Worry #1 – What if we run out of coffee? Solution #1 – Whoo Hoo! Guess what? 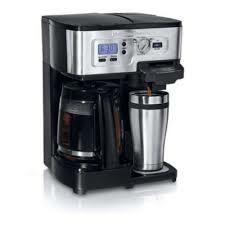 In the ultimate lucky coincidence, the Hamilton Beach Deluxe 2-way Brewer is on sale this week! I know, isn’t that exciting? I mean, check out the photo below: is this not the perfect appliance for a busy clutch of writers? Okay, I don’t know if ‘clutch’ is the right word either, but I’ve been using that one a lot lately since we have goslings in the neighbourhood, and somehow they make me think of our little group, paddling about if not exactly in formation, at least looking busy and determined. So, until someone comes up with a better word for a little flock of fledgling authors, I’m sticking with ‘clutch’. And this baby will keep our little clutch moving! Check this out: you can make a whole pot of coffee to start the group off, but that’s not all! In what must be a creation dreamed up for writers, you can also brew individual servings, too, so every writer can ‘fix’ when the need strikes (with either K-cups or the home packed equivalent). I mean, how perfect is that? Worry #2 – Mamma Mia! What are we going to eat? Solution #2 – Chicken Cacciatore Cinque Scrittori. Don’t you just love the internet? I mean, it only took me about three seconds to find out the Italian words for ‘Five Writers’. And tomorrow, our Cinque Scrittori will be enjoy a special ‘working writers’ dinner, made possible by a little whirlwind preparation this past weekend and the magic of my crockpot, which will heat everything up while we write, write, write away tomorrow afternoon. I’ll let you know how it turns out and if it is good, perhaps I’ll even sneak in a little extra post this week with the recipe. Worry #3 – What if we can’t concentrate? What if we can’t write? What if the muse doesn’t visit Gibsons’ Landing on Wednesdays in June? We are not alone. If we’ve said it before, we haven’t said it often enough. And I can’t pass up an opportunity to thank the spouses, kids, colleagues, friends and readers who cheer us on. Our support network that keeps us moving in the ‘write’ direction. This evening is the perfect example. 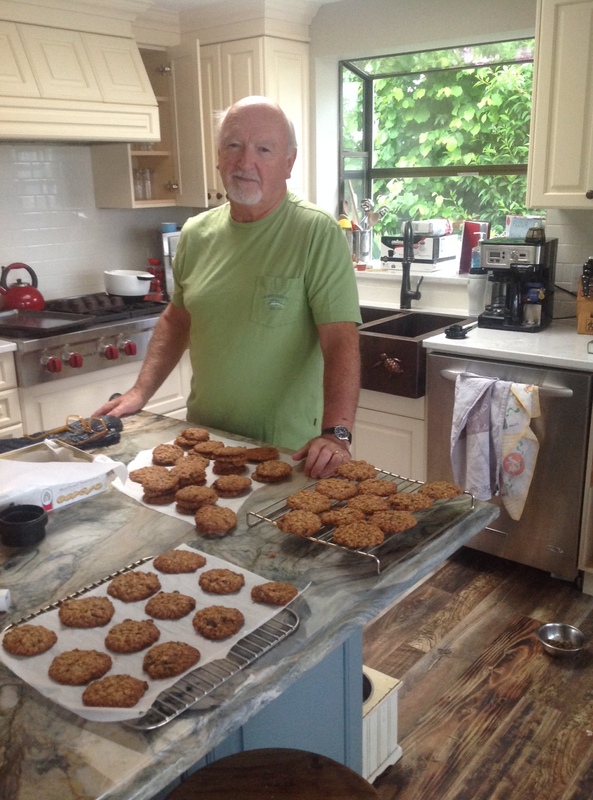 Yes, on the eve of the first annual Gibsons Landing 5writers Writing Retreat, my darling husband (who never cooks, never bakes) suddenly decided to make cookies for our group. Why, you could have knocked me over with a hummingbird feather! Your husband is a keeper! I know you’ll all have a fabulous time, and food and coffee always have a way of sorting themselves out. That John — he’s a gentleman and a scholar! And I’m greatly looking forward to the Chicken Cacciatore Cinque Scrittori — I’m sure Julia Child would be proud.